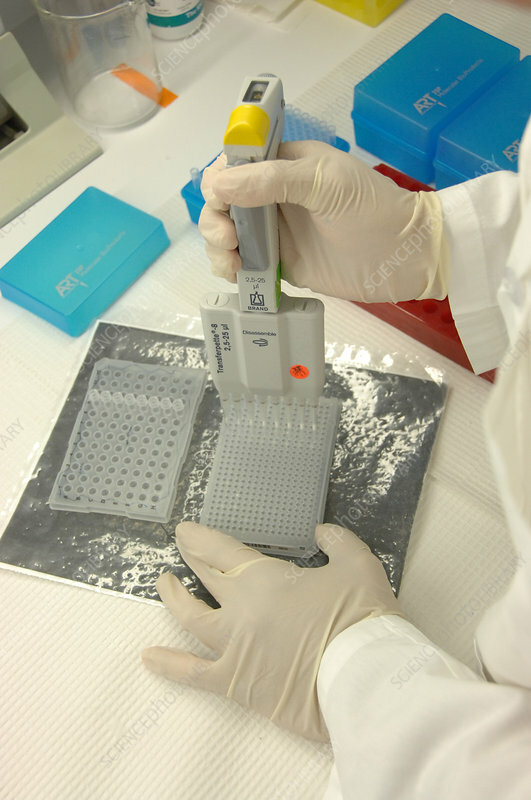 Researcher in lab uses pipette and measures RNA. A pipette or dropper is a laboratory tool commonly used in chemistry, biology and medicine to transport a measured volume of liquid, often as a media dispenser. For manual high-throughput applications like filling up a 96-well micro-titer plate most researchers prefer a multi-channel pipette. Instead of handling well by well, a row of 8 wells can be handled in parallel as this type of pipette has 8 pistons in parallel. Ribonucleic acid (RNA) is a polymeric molecule implicated in various biological roles in coding, decoding, regulation, and expression of genes. RNA and DNA are nucleic acids, and, along with proteins and carbohydrates, constitute the three major macromolecules essential for all known forms of life. No photographer credited, dated July 2, 2009.